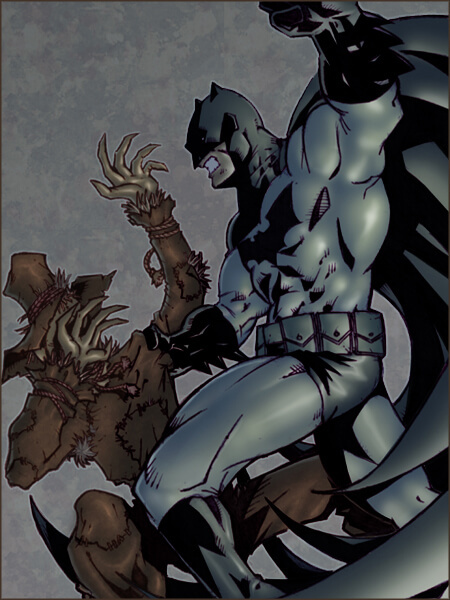 Batman takes on his greatest foe yet…the Seattle elite. 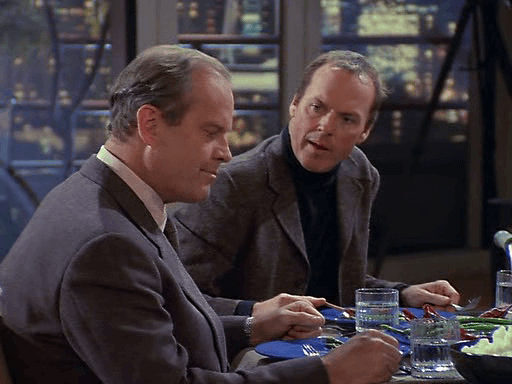 Before he was Beast in “The X-Men Film That Shall be Forgotten”, Kelsey Grammer played Frasier Crane in “The Kelsey Grammer Good Time Seattle Radio Psychiatrist Variety Hour”, better known as “Frasier”. 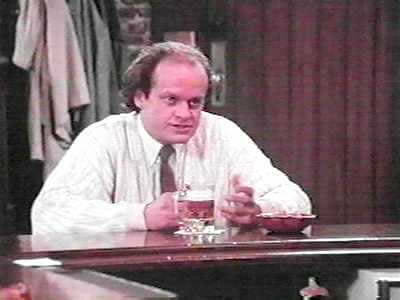 Frasier was about a snobby upper class radio personality living in Seattle with his friends and family. It ran for eleven seasons, containing such classic sitcom moments as ‘the time Frasier tried to get a girlfriend,’ ‘the woman who decided not to go out with Frasier’ and ‘Frasier’s dad can’t get with a girlfriend.’ It had 264 episodes in total, that’s more than Batman: The Animated Series and Batman (the 1960s show) combined! Did you know the Frasier end theme had actual meaning in relation to the show? 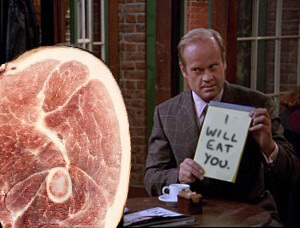 “Tossed Salads and Scrambled Eggs” wasn’t a literal insight into Frasier’s dietary habits, but rather was intended as a metaphor for the crazy kooks and loons he had to deal with in his psychiatric career. In an oddly unprofessional move, Dr Crane sees his patients as foodstuff, like when a cartoon character is trapped on a desert island with only one companion. The song ends with Frasier exclaiming “I don’t know what to do with those tossed salads and scrambled eggs…they’re calling again!” Oh Frasier, when will you get your life together? 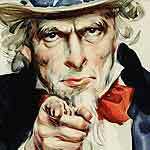 Having to juggle a job AND a personal life in the hectic hub-bub of a major American city? Sounds like YOU’RE just as crazy as your patients! You know what Batman does with ‘tossed salads and scrambled eggs’? HE SENDS THEM TO ARKHAM ASYLUM. The only real way to establish whether Batman or Frasier is better is to compare the two by rationally determining their similar qualities, taking a non-biased look at how each approach their subject matter, and then declaring Batman the winner with no real evidence. As if they’d ever give Superman a receding hairline. Surprisingly, even their approaches are similar, both treating their stories rather theatrically. Frasier often plays like a traditional stage production, with scenes clearly designed to suit a studio audience format. 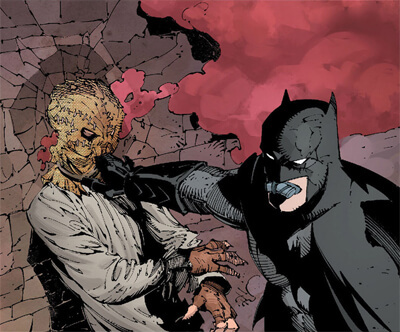 Similarly, Batman’s overly theatrical villains set up their traps and gauntlets as elaborate setpieces for Batman to work his way through, most recently evident in Scott Snyder’s “Death of the Family” storyline. If life is a stage, then Batman and Frasier are right there at the centre of it. And the Joker’s the weird, creepy director. Like James Cameron! The only real difference I see between Frasier and Batman is that Frasier uses psychiatry to help those in need whereas Batman uses fists. No, really, that’s the ONLY difference. Really. Perhaps if Frasier’s life had turned out a little differently we’d see a different series, one where he prowls the streets of Seattle dealing out helpings of Freudian justice. But we all know Dr Crane took a different path in life. That’s right, for eleven years we knew him as the lovable oaf Frasier, but Dr Crane has a secret life, forcing fear upon citizens for his own selfish needs. That’s right, Dr Crane…is the Scarecrow. Hello caller, what’s your problem? Care to make it worse? 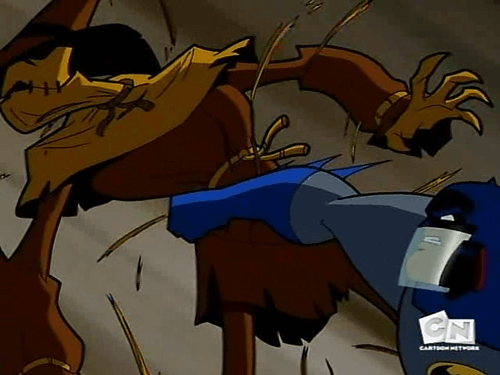 Frasier’s displayed flaws fit in with Scarecrow’s own personality traits – he is bold, brash, selfish and arrogant, often choosing to tend to his own needs before others. His inability to make it work with a woman can be seen as a fear of commitment, and after years of exposure to his fear toxin Scarecrow is addicted to fear itself. Many see Frasier as a spin off of Cheers, but I think it’s clear that it is, in fact, a spin-off of Batman, about a villain escaping Gotham City and trying to start a new life. Michael Keaton makes an appearance in a season 9 episode of Frasier as a conman friend who claims to have gone straight. 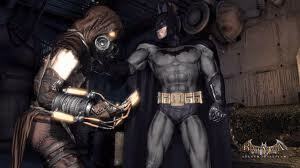 However, the Tommy Westphall Multiverse Theory implies that all screen fiction is connected, and so it seems clear to me that Keaton is reprising his role as the caped crusader, checking up on his old nemesis, Scarecrow. The conman persona even fits in with his streetwise Matches Malone alter ego! 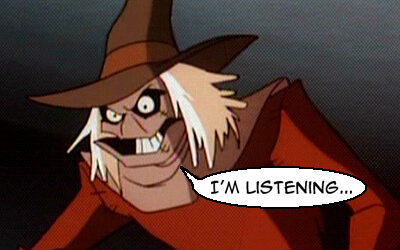 You thought you could fool us Scarecrow, but you know who you can never fool? BATMAN. And, of course, Ace the Bathound could take Eddie the adorable Jack Russell any day. Always leave ’em with a cute dog photo. 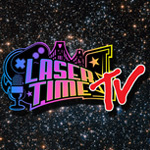 David B Cooper can be found ranting about Batman on Twitter, and also has comics, cartoons, and other stuff you should TOTALLY check out. Raising Arizona - Monday Night Movie! I have the tendency to do that when Frasier comes on! I think the reason I don’t really like Batman is because he’s the John Cena of DC. Too drunk to finish body of article. Will finish in the morning. But I notice some obscurities. Two-Face in a judge’s wig:? ‘Kay. Penguin in a Pope hat? All right. But can someone explain the frumpy, over-weight Wonder Woman to me? It’s important for personal reasons. So. I’d appreciate it if anyone could explain. 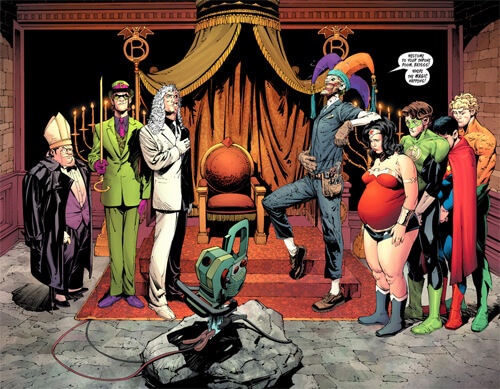 the joker forced random people to dress up like them as part of his messed up plan. forget what he uses them for, probably puts them in a death trap or something. It’s from Death of the Family. It’s all Joker, so don’t worry about it making sense. Batman never fell of a stage so he wins by default! Great article, love the premise. 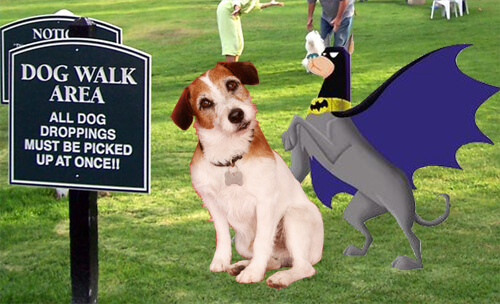 Maris is the Bat-mite of the Frasier universe. Also we all know that Martin was the superior crime fighter during his prime. I can’t disagree with that analysis, but I will say that if Norm was in a conflict between Batman, Norm would order up a round, and Batman wouldn’t even make a grimacing face at the kindest gesture from a pub’s most renowned regular. What I’m trying to say that Norm is better than Batman, in every, possible, way. Finally, someone has tackled this age old debate. Thank you.